Constructed from 100 x 50 RSC, with 5mm pressed channel section, fully welded with ‘A’ frame drawbar & front standing plate, pressed rear lighting channel. Avonride twin 1500Kg torsion beams fitted with 200 x 50 Auto Reverse brakes, Gas strut assisted parking brake,break away cable, Knott 3000 Kg Auto reverse coupling fitted with 40 mm eye or 50 mm ball. 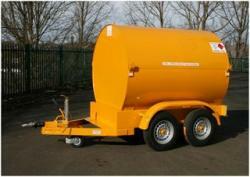 4 No 185 x 13 x 8 ply radial tyres on 4 stud 5 1/2” pcd rims, Tandem mudguards, Telescopic front jockey wheel. Full road lighting c/w 7 pin plug. Constructed from translucent heavy duty polyethylene, baffled, 2” filler cap & chain. 2” vent valve, P.R.V.in tank top, 1/2” bsp suction & return in tank top, Ball valve in base of tank to pump .K2 semi rotary pump c/w 15ft of 1” diesel hose & trigger nozzle stowed on bracket. In line ‘Y’ strainer. All contained within lockable bund area.